Manihot esculenta leaf sewn onto this Herbarium sheet. I remember hearing as a small child the rumour that swallowing a single apple seed would kill you. Whilst I later learnt that this was false, it is true that the cyanide in apple seeds means that theoretically, chewing a large number could cause poisoning. Cyanide is a simple chemical produced by many organisms, often as an unwanted by-product. But cyanide is found in relatively high levels in many plant species, including the seeds of many common food plants, such as peaches, almonds, and legumes. Manihot esculenta tubers, sold as cassava or yuca. Source. The cyanogenic plant I will focus on here is cassava, Manihot esculenta, also known as yucca. It’s tubers are a major carbohydrate source throughout the tropics due to its drought tolerance and ability to thrive in poor soil. It is probably most well known in the UK in the form of tapioca pearls in puddings. Cyanide is a general defence against herbivores, as at the right dose it can kill anything that respires. There is variation in the levels of cyanide in fresh cassava tubers, “sweet” strains have as little as 20mg/kg whilst “bitter” strains have up to 1g/kg. It has been suggested that when early farmers selected plants with the best insect resistance, they were inadvertently choosing plants containing small amounts of cyanide. This means that sometimes the decision to grow (potentially) dangerous food is not a straightforward one, and higher cyanide cassava is often preferentially planted due their greater pest resistance and drought tolerance. Manihot esulenta in the form of tapioca pudding. Source. One of the founding principles of toxicology is an adage derived from Paracelsus: it is the dose that makes the poison. But the case of cyanide in cassava root goes to show that it is not only the dose that matters; the ability of the host to deal with the dose can be the difference between life and death. The lethal dose of cyanide has been reported as 1mg of cyanide ions per kg of body weight, but it is difficult to ingest this from cassava. At lower levels, chronic cyanide poisoning can have serious effects, especially in people who are already malnourished. For those with diets low in Sulphur containing amino-acids, the body cannot add the Sulphur to cyanide to make it safe. They therefore struggle to remove cyanide at amounts a healthy person could do easily, so cyanide becomes cyanate, which is associated with neurodegenerative diseases. Severe cyanide poisoning can lead to a permanent paralysis of the limbs known as Konzo, which can be fatal. Unfortunately, the hardiness of cassava means it does become relied on when other crops fail and the population is already malnourished. This Herbarium sheet states that “natives eat the roots”, but so do many people around the world. However, cyanide can be removed from cassava by proper processing. Cassava stores cyanide as a chemical called linamarin, which released cyanide when hydrolysed. This occurs which can occur in the gut if ingested, or when the cassava is soaked and mashed. If done thoroughly, processed cassava is safe to eat. However, if it is done by hand, the person preparing it can inhale a considerable quantity of cyanide gas. Additionally, the water by-products of cassava processing are rich in cyanide so can be an environmental hazard. A genetically engineered strain of cassava lacking cyanide would be a valuable crop to large agricultural companies, as it would cut down on processing time. However, for small scale farmers with poor soil, drought and no pesticides, the cyanide in cassava acts as a built in pesticide and allows cassava to thrive when little else can. This shows perfectly that poisons are not always villains, but if dealt with carefully can be a vital part of a crops’ survival tool-kit. For more information, see this excellent article on cyanide in food plants. This entry was posted in Manchester Museum, Poisonous plants, The Poison Chronicles, University of Manchester and tagged cassava, cyanide, manihot, plants, poisonous, tapioca, tubers. Whilst many species of plants are referred to as mistletoe, the icon of Christmas is the European Mistletoe Viscum album. Mistletoe has a varied reputation; it is a symbol of Christmas and druidic ritual, a poisoner and a matchmaker. The plant itself belongs to the Santalacea or sandalwood family. It is found throughout much of Europe, but in the UK is localized to the central south. V. album lacks its own trunk and instead grows in the crowns of host trees including apple, lime, hawthorn and poplar when its seeds are dispersed by birds smearing the sticky fruit and seed from their beaks onto the bark of the host. V. album is not a true parasite but a hemiparasite. This is because whilst the seedling sends its haustorium from the roots through the bark of the host to induce the host’s xylem vessels to supply it with water and nutrients, V. album makes its own sugars through photosynthesis. 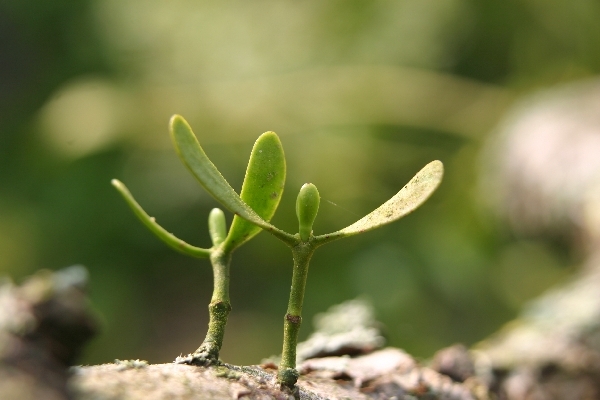 A heavy infestation of mistletoe can take over the entire crown of a tree preventing the host photosynthesising and building its own tissue which can lead to the death of the host. V. album owes its toxicity to large amounts of the alkaloid tyramine throughout the plant, which is also present at lower levels in foods including cheese. As with most toxins, it is the dose that makes the poison, not the chemical. Whilst little research has been done on the effects of consuming V. album, it has been reported that consuming enough of the leaves or berries can result in nausea, abdominal pain, diarrhea and death. However, the well-known risks of mistletoe means poisoning cases are very rare. As the Poison Garden argues, artificial mistletoe is likely more dangerous as a choking hazard to children than live mistletoe is as a poison. Whilst mistletoe is commonly linked with druids, the only account of a druid ceremony involving mistletoe comes from Pliny the Elder. He details a banquet and ritual sacrifice where a druid would climb an oak tree, cut the mistletoe with a golden sickle and drop it into a cloak to prevent it touching the ground and losing its power. The link between druids and mistletoe was picked up in the revival of druidry in the 18th century and today druids carry out a similar ceremony, without the human sacrifice! The tradition of kissing under the mistletoe at Christmas is not a Christian tradition but also derives from the association of mistletoe with fertility in druidic mythology. Christianity has a less favorable relationship with mistletoe, as according to tradition mistletoe wood was used to makes Christ’s cross and ever since could not grow upon the earth so was condemned to parasitic life. Mistletoe has also been used as a medicine historically, including as an epilepsy treatment. Today, injection of extracts of mistletoe has been used as an anti-cancer treatment in alternative and complementary healthcare. Whilst it has been shown to kill cancer cells, the few trials done were inconclusive or poorly done, and the NHS advises that there is currently no reliable evidence that mistletoe is effective at treating cancer. 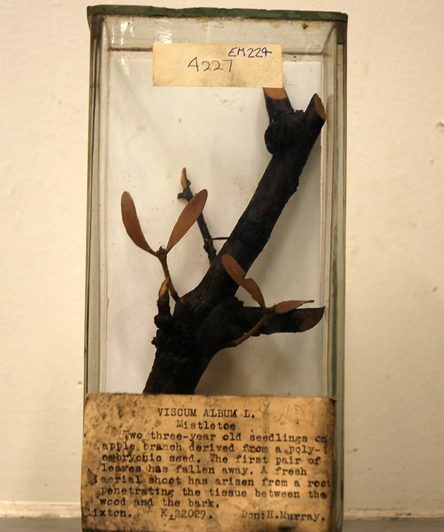 This entry was posted in Manchester Museum, Poisonous plants, The Poison Chronicles, University of Manchester and tagged Christmas, Mistletoe, plants, poisonous.